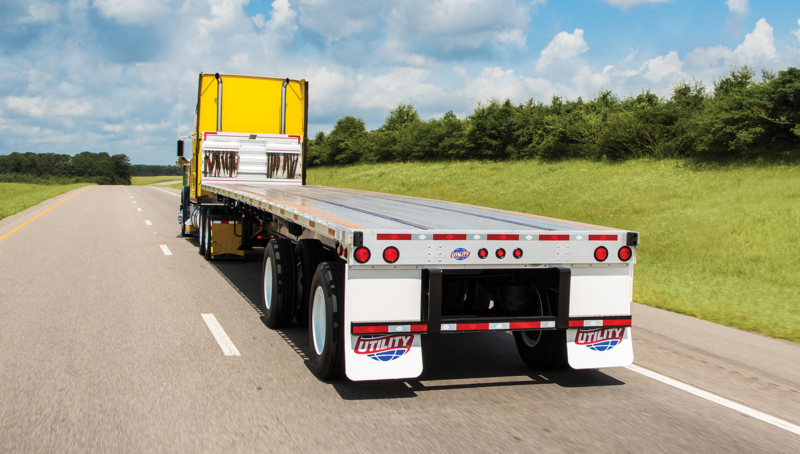 Utility Trailer Manufacturing Company, a leading manufacturer of refrigerated trailers and dry freight vans, flatbeds, and Tautliner® curtainsided trailers, has announced the introduction of the new 4000AE™ flatbed trailer. The 4000AE flatbed replaces steel crossmembers with a new patent-pending design that uses 3” and 4” aluminum crossmembers – contributing to an overall 536 lb. weight reduction while adding a standard coil haul package. Each crossmember sits in a patent-pending saddle that does not use mechanical fasteners to connect the crossmember to the steel main beams. For added stability, three tube-shaped outriggers are located on each side of the 4000AE and are connected to the aluminum crossmembers – aiding in even load distribution to the steel main beams. The 4000AE comes standard with a 47,000 lb. coil haul package, yet it is 536 lbs. lighter than the 4000A base model, and 627 lbs. lighter than the 4000A flatbed fitted with an optional coil haul package.